I love Cinnamon Rolls. So much so that I've come up with my version of a non-yeast cinnamon roll, which I call Cinnamon Roll Scones. I think they're a quick and easy alternative when you're pressed for time. The scone dough is made with buttermilk which gives them a bread-like texture. Try to serve these Cinnamon Roll Scones warm from the oven, when they are good either plain or with a drizzling of a powdered sugar glaze. When you make scones do not over mix the dough, as this will result in a tough scone. That is why I prefer to make them by hand. (But you can successfully mix part of the dough in your food processor. That is, the dry ingredients can be mixed together in the food processor and then you can add the butter and pulse just until you have coarse crumbs.) Always have your butter cold and cut it into small cubes as this makes it much easier to blend it into the flour. Mix the buttermilk in by hand, even if using a food processor, as you do not want to over mix causing a tough scone. As always, scones are at their best shortly after baking and if you want a powdered sugar glaze, mix 1/2 cup (60 grams) powdered (confectioners or icing) sugar with 1-2 tablespoons of milk until you have a pourable glaze, and then drizzle over the top. Buttermilk has a thick creamy texture with a rich and tangy buttery taste that makes these scones tender with a bread-like texture. Whereas in the past buttermilk was made from the liquid left over after churning butter, it is now commercially made by adding a bacteria to whole, skim, or low fat milk. You can make an excellent buttermilk substitute by adding 1 tablespoon of white distilled vinegar, cider vinegar, or lemon juice to 1 cup (240 ml) of whole or reduced fat milk. Let stand at room temperature for about 10 minutes before using. Another option is to use buttermilk powder which can be found in some grocery stores or in specialty food stores. 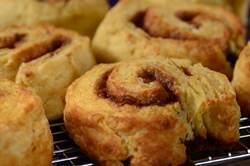 Cinnamon Roll Scones: Preheat oven to 400 degrees F (200 degrees C) and place oven rack in the middle of the oven. Butter or line a baking sheet with parchment paper. Transfer the dough to a lightly floured surface and knead the dough gently and then roll into an 8 x 11 inch (20 x 28 cm) rectangle. Spread the softened butter over the dough. Sprinkle with the raisins, if using. In a small bowl stir together the brown sugar and cinnamon and sprinkle it evenly over the butter. Gently press the mixture into the dough and brush one edge of the 11 inch (28 cm) side of the dough with a little milk or cream (to seal the edges of the rolls). Roll the dough to form a log, starting at the end opposite the edge you brushed with milk or cream. (Do not roll the dough too tightly or the centers of the rolls will pop up during baking.) Slice the log into eight equal-sized pieces and place on the baking sheet. Brush the tops of the scones with a little milk or cream. Bake for about 17-20 minutes or until a toothpick inserted in the middle of a scone comes out clean. Remove from oven and place on a wire rack to cool slightly. Best served warm from the oven, but they can be covered and stored at room temperature for a few days. Makes 8 Cinnamon Roll Scones.